This has been my go-to daily the last few months. Yes, it drives me nuts. Yes, there are characters that literally – yes, literally, not figuratively or virtually – make me cringe. Yes, I fast-forward through most of it. But Park Chan-woo (Seo Do-young) and Gong Soo-rae (Yoon Son-ha) are so sweet together, and though I oftentimes go mad from their unending well of kindness, I must admit it certainly would make for a more beautiful world if we were half as kind as these two. Now, they ain’t perfect, but they aspire to be better human beings than the majority of the people that populate their world. And that I can heartily applaud. Madness. Absolute madness. I swore that I would never again watch an Im Sung-han drama… and then stupid Jang Hwa-eom (Kang Eun-tak) sucked me in with his wearing-his-heart-on-his-sleeves business. I was able to quit the addiction… and then fell back in. Of course, my “watching” a daily constitutes of watching the preview and skimming through the official Youtube clips, and then fast-forwarding through the relevant parts if the preview is fabulous… but hey, that still counts, no? 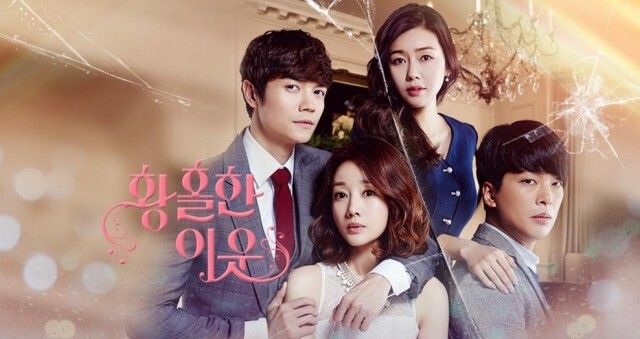 Anyhow, there are only 10 episodes left, and I am convinced *SPOILER ALERT* that Ya-ya (Park Ha-na) is hiding somewhere (not in the bottom of the ocean) and Hwa-eom will eventually find her, and they’ll live happily ever after – and have a mabajillion daughters and make those evil witches of the Jang family + Sun-ji feel terrible like no other. Ahem. Yeah, working on that be-kind-to-others thing. *END SPOILER* I guess we’ll find out what happens in 2 weeks! My LUUUURVE. This show premiered around the time I was feeling stressed and wanting to crawl into a cave. I enjoyed the first episode, felt pressured to rush through the second, felt even more pressure to skim through the third… and then finally decided I needed to just enjoy the show. Now, don’t get me wrong. This ain’t no Punch. But it gives me the tickles and squees I so wub, and it does it in a way that isn’t cartoonish or immature. Note, I never said Kang Min-ho (Jung Kyung-ho) ain’t immature. But his immaturity SLAYS me with how adorable it is. Gaah, I’m fighting to keep that maginormously goofy grin off my face right now just remembering how awkward and adorbs he was in today’s Episode 9. Heeee! Kim So-yeon gets to show off her super-efficient, professional persona then switch over to her more natural bubbly sweetness, which I wub. Yoon Hyun-min is doing decently, and he shows flashes of genuineness, which I’m sure will continue to develop in the projects to come. I love that the show is sticking with its guns and keeping the “comedy” alive in its proclaimed “romantic-comedy” genre. And there’s just enough meat to keep things grounded so we don’t get carried away into fantasy-land. Now, the whole cellular memory thing and the hand-wavy medicine discussed does make me break out in hives… but if I, of all people, am willing to overlook it, why can’t anyone else? 😉 Anyhoo, it’s been an absolutely fantabulous ride these last few weeks – get on it if you haven’t already! I dropped FFI because I wan not enjoying it. I think these cellular memory dramas are not made for me. Lol. I was not feeling anything for anyone and that whole corporate talk was just so boring! FFI is indeed an old fashioned drama where anyone could see the “happy” ending. Nevertheless, it’s the journey that matters in the end, according to the late Hernest Hemingway. For me, it was a pretty little trip with great acting and a decent scenario on a cable channel. The most tiring thing was the coorperate dialogue. However, even then I could see the necessity for the writer to show off MH’s talent in business and display his personal ethics, as well, before and after his heart transplant. It was one “honest” drama, for sure!